Yard signs promoting God's marriage get torn down while equality signs are left untouched. 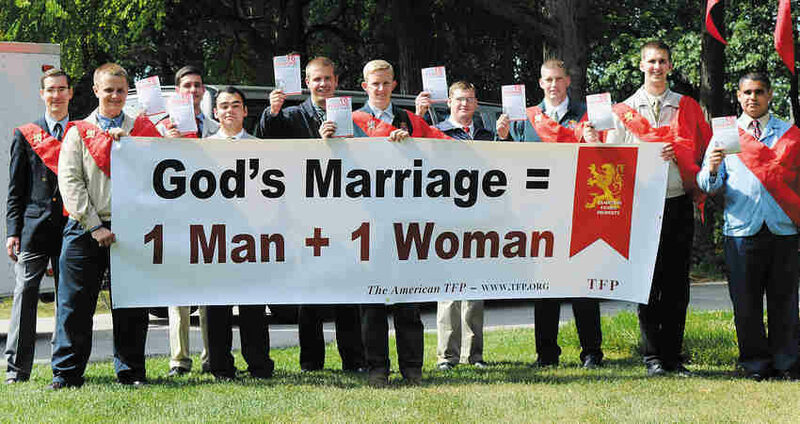 In a newly released video, volunteers with TFP Student Action describe how their signs promoting God's marriage were ripped down at several high-profile Catholic campuses, including Loyola University Maryland, Georgetown University, Notre Dame of Maryland University, Villanova University and St. Joseph's University. “It's pretty awful. Just the sight of the name of God and God's plan for marriage is considered intolerable by students who think tolerance is a dogma," said Matthew Miller, 23, a TFP volunteer who promotes moral values on college campuses. "You'd expect to see more support at Catholic colleges, but I found zero tolerance for true marriage," Miller said. "All my signs proclaiming God's marriage as the union of 1 man + 1 woman were either ripped up, damaged, stolen, or put in the trash." The video shows students at one campus using a wire frame to punch holes through the pro-marriage yard sign. "I was curious to see what would happen if I put up equality signs, so I decided to do a test," explained Miller. "I made my own equality signs and set them up on several Catholic campuses. And you can probably guess what happened -- the equality signs were left untouched and undisturbed." "Although some Catholic colleges still strive to serve God, the general trend is not good," Miller said. "If our culture continues to follow the sinful road map of the homosexual movement, the outcome will be predictable. The strange dictatorship of pseudo-tolerance and make-believe equality will only allow freedom of speech when it advances sinful lifestyles. God, family values and public morality will be off limits and targeted for destruction -- even on Catholic campuses."